Anti-nuclear protestors showcase public demonstration at the city's train station. 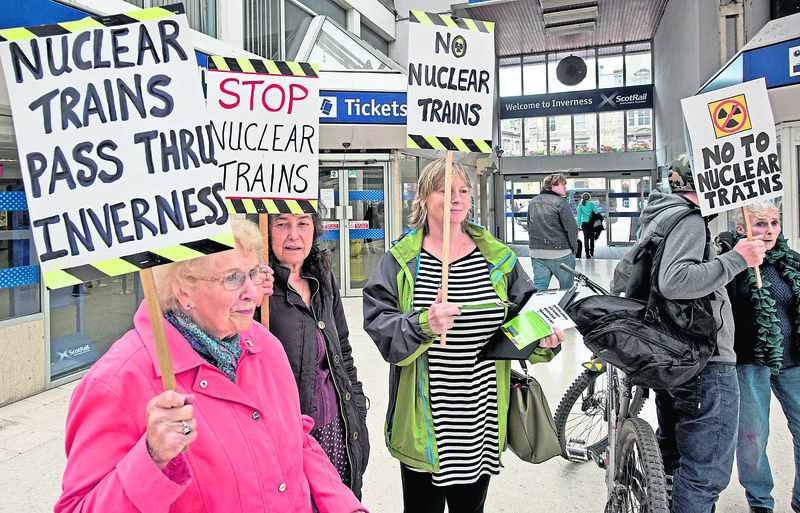 More than a dozen campaigners from Highlands Against Nuclear Transport (HANT) and Cromarty Peace Group (CPG) joined together outside Inverness train station to show their objections in the movement of radioactive waste from Dounreay in Caithness to Sellafield in England. Protesters camped outside the doors of the city train station for almost an hour holding up a number of banners highlighting the dangers they claim are being imposed on the region. Members of the public were also encouraged to sign postcards containing a petition to the UK Government demanding the halting of all nuclear transport across the north during the demonstration. Simon Evans, of the Cromarty Peace Group, said the group were delighted to be able to contribute towards the cause. The demonstration comes just one month after a train carrying nuclear waste skipped a red signal near Kingussie as the Caledonian Sleeper service was heading north. HANT chairman Tor Justad said the incident “should concern everyone in Scotland”. Mr Hendry says he was optimistic that the weekend’s demonstration would help shed light on the concerns of Highlanders from across the region. The transportation of nuclear waste is conducted by rail operator Direct Rail Services and has been in operation since 2012, with an around 40-50 journeys estimated per year.